We are a Traditional Chinese Medicine clinic providing Chinese Herbal Medicine treatment for the entire family. We pride ourselves with service. Our practitioners all take great time and care to listen to your health concerns, understand your condition and construct a comprehensive treatment plan. You will be left with the peace of mind that you are receiving top quality health care. The cornerstone of a treatment plan from Sattva Natural Therapies is balance and harmony. The pressures of our modern lifestyle often lead to stresses which can, in turn, manifest as health issues of one sort or another. To maintain my personal balance and harmony I have been drawn to clay and the wonderful world of lush glazes. Pottery with its roots embedded deep in China’s history alongside Chinese Herbal Medicine, seems like a natural fit. In many ways the design of a herbal formula and the design of a glaze formula have a similar resonance. And yet they are different. The herbal formula requires assembling all of the information regarding the disharmony that is presented, and creating a very focussed treatment plan and formula to support the body back to full health. The glaze formula also requires a focussed adherence to the laws of chemistry but when combined with the form, glazed surfaces can go anywhere from a plain single colour to a full spectrum of intermingled colour and texture creating, hopefully, harmony and poise. Is the form practical, a bowl for instance or a decorative sphere and which glaze or combination of glazes will best suite this particular form? It is this contemplation that I find grounding and stimulating. 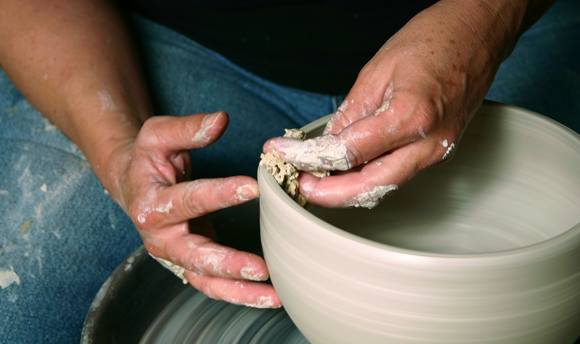 A glaze for a bowl may have its genesis in an aspect of nature. I like for instance to work with red iron as a colorant with the addition of blues, whites and green. To me this is a connection back to the earth where all the materials used have originated. Similarly I often happily leave the foot of the bowl, which is unglazed, as an obvious counter point to the glazed piece. To me this is a yin yang interpretation. The fully glazed area versus the foot of unglazed material showing its origins. I feel that whether I am writing a herbal formula or thinking about the glaze surface I am aiming for a space within myself that has balance and harmony….. an ongoing journey! !